Brian Kassab & Associates Real Estate Services was founded in 1996 by Brian Kassab. Brian has successfully grown the business to be the largest real estate office on the island, employing a number of experienced, full-time staff to assist in meeting all your real estate needs in and around St. Kitts & Nevis. Combining our extensive international marketing knowledge & experience, global market exposure via our newly designed website and our invaluable years of firsthand knowledge of the best of St. Kitts & Nevis real estate, we have earned an irrefutable reputation as the foremost office of real estate professionals in St. Kitts & Nevis. Listing your property, for sale or for rent, with Brian Kassab & Associates Real Estate Services is putting your prized and valuable asset into the hands of a group of real estate professionals that will leave no doubt that your best interests are being served first, last and always. Using our website as well as our extensive lists of international contacts, accumulated over years in the industry, assures that your property will be exposed to and seen by targeted people looking specifically for what you are offering. If you are looking to purchase a property, be it as a retirement home, an income property, an investment property or to gain citizenship, we have the experienced staff to help you in every aspect of the purchasing process, from finding the perfect property to being sure all the proper documentation is completed accurately and in a timely manner. You can use our newly designed website to search through our online database to browse our current listings of properties for sale or for rent. Our listings include everything from private homes, to development properties, condominiums, villas, resorts, plantation homes, as well as commercial properties and building lots. For those interested in the St. Kitts Citizenship by Investment Program, we can offer help with the following for purchasers of selected real estate. Whether you are looking for that prized second home in the Caribbean, relocating to the islands for work reasons or just moving up the property ladder, Brian Kassab and Associates has the experience to guide you through the sometimes bewildering steps of property sales and purchases in St. Kitts and Nevis. Brian Kassab and Associates can help you whether you are looking for a villa, house, condominium, land, or commercial property as well as large parcels of land suitable for large scale development, island-wide. Brian Kassab & Associates is a long-established Real Estate business, and has, since 1996, offered a service second to none in Basseterre, St. Kitts, successfully managing, renting and selling a carefully selected portfolio of luxury residential and commercial properties. "Having vacationed on many Caribbean islands for many years, this year we decided to purchase a vacation/retirement villa on St. Kitts. With the Brian Kassab Associates team, and especially with Kym Taylor leading the way, our search was a stress free pleasure. The second property that we were shown was a perfect fit, meeting all of our "wish and want lists". Kym's attention to detail and communications, during, and after the search, sale and closing, continues to this day. 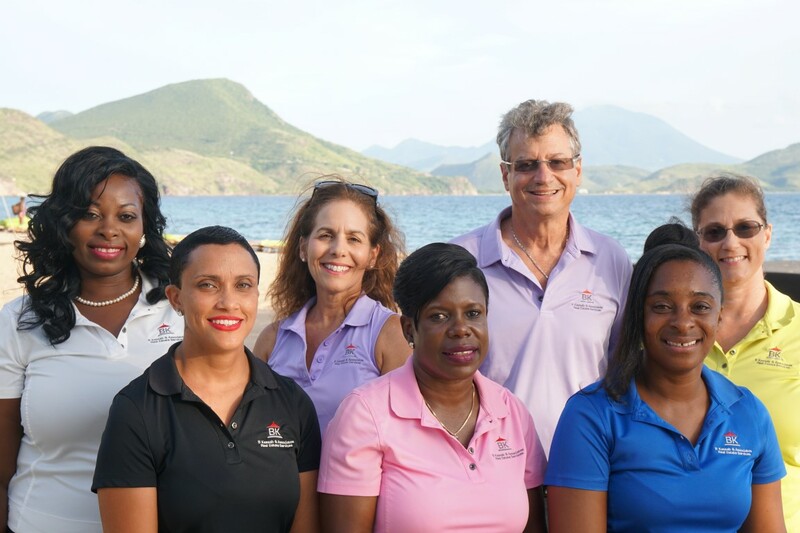 Additionally, having the Kassab Associates team manage our St Kitts villa, when we are not there, reinforces that we made the correct decision. Thank you Kym, and the Brian Kassab Associates team." "Many thanks for your exhaustive efforts showing us all those properties. You worked very hard and we are extremely grateful. [snip] Shelley, you are a very professional agent and we certainly hope that we will meet later in the year and maybe be able to locate our new home and start our new life. " "The people at Brian Kassab & Associates have been an absolute pleasure to deal with. Melissa is both professional and thoughtful in her approach to and dealings with customers." Dress Code - Casual everywhere but not beach attire. Must wear a shirt/wrap in town. You will be more comfortable in some of the fine dining restaurants a little more elegantly dressed but formal attire is not required anywhere that I know of. Tipping - Most hotels and restaurants automatically add in a 10% service charge. You may give additional tips if service warrants it. ATMs - All four banks in St. Kitts have ATMs in Basseterre. The National Bank has a number of others at various places around the island, but I am unsure if your card will work in them. Your best bet is to go one of the three banks on the Circus in town or the Scotiabank in Birdrock. The Marriott Casino ATM give US currency but only works with Visa, M/C and debit cards on Cirrus network. All other ATMs will give funds in EC dollars. Credit Cards - Most hotels, restaurants and businesses take all major credit cards although some can not accept American Express. Do not assume you can pay by credit card. Entry Requirements - Visitors will require a passport. It is also very important to have an exit ticket to somewhere, most preferably your country of origin, regardless of the length of your stay. Driving - Rental vehicles are readily available (cars, vans, 4x4s, scooters). Driving is on the left hand side. You will be required to purchase a temporary license for about $25US. The secret is to drive slowly and always be ready to stop short as many drivers will stop with no warning to chat with someone on the sidewalk or what have you. Also be aware of the ditches built across the road in the country as they can be devastating if you do not slow down first. Gasoline - Gas prices just went up for the second time since I arrived here 4 years ago and are now about $3.89US a gallon but you will be hard pressed to burn a tank of gas even if you drive continuously all week as the island is so small. Stations are located in Birdrock, just out of town by the hospital and a little further out the same way towards Ross University there is a 24 hour station. There is also a station just past Brimstone Hill Fortress and one in Cayon. A Foreigner needs an Alien Land Holding License to own real estate/property on St. Kitts, except in Frigate Bay and, under certain circumstances, property purchases on the SE Peninsula, which are exempt. This should take about 1-3 months for approval once all the paperwork has been submitted. We can recommend local attorney's who can help you with this process. Fully serviced real estate land lots in St. Kitts start from US$80,000, depending on the size and location. Real estate construction costs vary. US$150 per square foot of roofed area depending on location, design and quality of finish. A 2,000 square foot house takes about 10 months to build. There is a good Government water supply below the 800' contour. Water costs approximately EC $10 (US $3.70) per 1,000 gallons. Electrical charges for an average family in a 3 bedroom property heating water with electricity is roughly EC $800 (US $300) per month. Cable TV (42 channels) costs EC $125 (US $40) per month. Grounds maintenance for 0.5 acre costs approximately EC $320 (US $120) per month. Property management costs approximately EC $405 (US $150) per month. A 3 bedroom property with pool (not on the beach) rents short-term for US $2500 to US $3000 per week in high season, US $1200 - US $1500 per week in low season. Rental commissions vary from 15% to as high as 25%. Long-term rental (3 months plus) from US $1500 to US $3500 per month and normally attract a 10% commission. Maid services start at EC $15 (US $4.05) per hour. There is no personal Income Tax or Inheritance Tax at this time. House Tax ranges from US $800 to US $3,000 per annum. The EC dollar is tied to the US dollar at a fixed rate of $2.70EC to $1.00US. You can also have foreign currency accounts at most of the banks, thus keeping your funds outside foreign currency controls. An Economic Citizenship Program (Citizenship by Investment Program) exists providing the possibility to qualify for citizenship through investing over $400,000US in pre-approved real estate projects. Foreign individuals can obtain citizenship of the Federation of St. Christopher (St. Kitts) and Nevis if Cabinet is satisfied that such person has invested substantially in the Federation. The legal system is based upon English Common Law served by a High Court of Justice, a Court of Appeal, and Her Majesty's Privy Council in London. St. Kitts & Nevis have agreed to be included in the Caribbean Court of Appeals Circuit. The spoken and official language of St. Kitts & Nevis is English. Interpreters are available for other major international languages. The education system has been rated very highly by the World Bank in its report on the Access, Quality and Efficiency in Caribbean Education. With 98%, St. Kitts & Nevis has the highest level of literacy in the region and its CXC and GCE results are among the highest in the English speaking Caribbean. The Robert L. Bradshaw International Airport on St. Kitts (IATA: SKB, ICAO: TKPK) has a runway of 8000 feet and is equipped to handle large passenger jets. Vance Amory International Airport on Nevis can accommodate smaller aircraft. Weekly direct flights are available from London Gatwick to St. Kitts. For other destinations, the islands are using Puerto Rico, St. Maarten and Antigua as their major gateways. Access from and to these gateways is by twin-engine turboprop aircraft operated by regional scheduled airlines on a daily basis and by smaller aircraft operated by local charter companies. Port Zante in St Kitts can host up to two mega-cruise ships and has a 61-berth marina for pleasure crafts and private yachts. The deep water port in St. Kitts has modern facilities which include roll-on and roll-off docks and easily accommodates large freight carriers. St. Kitts & Nevis has a state-of-the-art telecommunication system operated by Cable & Wireless, Digicel and UTS CariGlobe "Chippie". Their modern network permits smooth and prompt telephone, telex, facsimile and Internet connections throughout the world. Cable & Wireless operates an online Telephone Directory and Yellow Pages web site. St. Kitts & Nevis enjoys a 59-channel cable TV service, which provides 24 hours daily entertainment, sport and news programs from North America and England via satellite. On average, airmail letters from North America take 10 to 12 days and 7 to 10 days from Europe. Major international courier services are represented by Brinks, D.H.L., Federal Express, United Parcel Services, and Worldwide Express. St. Kitts & Nevis has a history of political stability based on the Westminster model of government and continuity of national policy. Since St. Kitts & Nevis attained independence from Britain in 1983, it has consistently been adjudged to be among the world's freest nations by Freedom House, an independent and highly respected research organisation in the United States of America. Sugar, which used to be the backbone of the economy, has recently been dropped completely. In its place, the Government has begun aggressively promoting tourism, light manufacturing and international financial activities. The Eastern Caribbean Central Bank, The Eastern Caribbean Home Mortgage Bank, and The Eastern Caribbean Securities Exchange have their headquarters in St. Kitts. Three international banks are represented in St. Kitts (Bank of Nova Scotia, First Caribbean International Bank, and the Royal Bank of Canada) and two in Nevis (Bank of Nova Scotia and First Caribbean International Bank). Banks maintain deposits in XCD, USD and GBP. The legal profession is represented in St. Kitts & Nevis by Barristers and Solicitors of the High Court. They alone have the right to practice before the Courts of St. Kitts & Nevis, and alone may give advice on local law within the Federation. PriceWaterhouseCoopers, one of the five major international auditing firms, is represented in St. Kitts. The Confidential Relationships Act of 1985 prohibits the disclosure of any information obtained in the course of business; and applies to banks and professionals as well as to Government officials. Certain businesses need licences and applicants should seek advice locally on each occasion. The Federation and the United States of America have entered into an Investment Guarantee Agreement. There is a tax on land located in the Federation, this tax is charged at various rates depending on the size and nature of the land concerned. 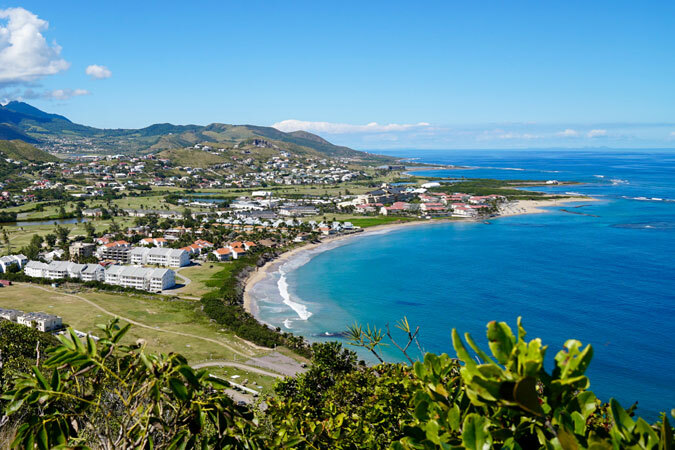 In Special Development Areas, such as the South East Peninsula on St. Kitts, there is a tax of 0.5% of the assessed market value of the land, or land and improvements. A house tax is charged at the rate of 5% of the annual gross rental value for residences in St. Kitts or Nevis with a 25% rebate for properties that are occupied by their owner solely as residence. The minimum annual rental value is XCD 600 (USD 222) in St. Kitts and XCD 48 (USD 18) in Nevis. St. Kitts real estate and Nevis real estate stamp duty is 10% for free hold properties and 10% for condominiums. Stamp duty is payable by the seller only. St. Kitts real estate and Nevis real estate legal fees are approximately 2% of the gross purchase price. St. Kitts real estate and Nevis real estate alien land-holding licence is 10% of the gross purchase price (where applicable). Properties in Frigate Bay and the following designated areas are exempt from this licence.